Use your own color photos to customize a calendar for a terrific fundraiser for schools, teams, booster clubs and more. #5401U, min 100. If you are looking for a useful giveaway or fundraiser, why not try a carabiner bottle strap that has your name or logo imprinted on the strap? Short classic webbing bottle strap includes 1 color imprint on 1 color webbing or webbing with no imprint. Item includes carabiner and rubber O ring hardware. O-ring hardware stretches to fit all standard bottle size necks up to 2 liter. Straps come in: athletic gold, beige, black, brown, cardinal red, copper, forest green, gold, green, lavender, lime, maroon, mint, navy, orange, pacific blue, pink, purple, rainbow, red, royal, silver, sky blue, soft pink, tan, teal, white or yellow. 3/4″ x 6.5″. No charge for set up if straight line copy. Logo, special type or specific layout will be a 60.00 set up. Min. 50 at Item BH306-67. Is it hot where you are? Tired of burning your hands when you get in your car? So are those around you. From working as part of several political campaigns over the past few elections, these came to mind. Great for school or community fundraisers as well. Fold-up car or truck sunshades with your message imprinted on them. 27″ x 56″. Anywhere you park becomes a place where you can get your message out. Great for political campaigns! You can park in a lot or at a corner where traffic goes by, and voila, people passing by see your message. No one can take your sign down or tell you you can’t put a sign up if you can legally park there, your message can be posted. Easy to open and fold down. Also great for school or booster club fundraisers and more. 16″ diameter imprint area on each side of front. Where can you get a big impact for 7.75 ea with a minimum of only 50 pieces. 7.50 ea for 100 or more through Dec 20, 2013. Also make great fundraisers for schools, churches and community groups. 50.00 set up. Contact cheryl@thankem.com for more information or for other ideas or items. 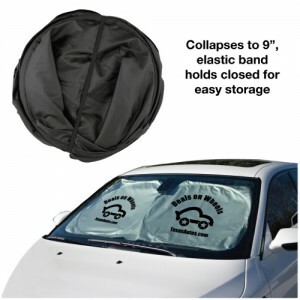 (10.00 ea at 25-49 sunshades). Backpack is made of sturdy 80gsm non-woven polypropylene. Hand washable and recyclable. string shoulder straps loop for a quick-close top. Weight tolerance: 10 lbs. For schools order with logo or school name. Elementary school or middle schools can order middle or high school bags to sell to graduating students as fundraisers. 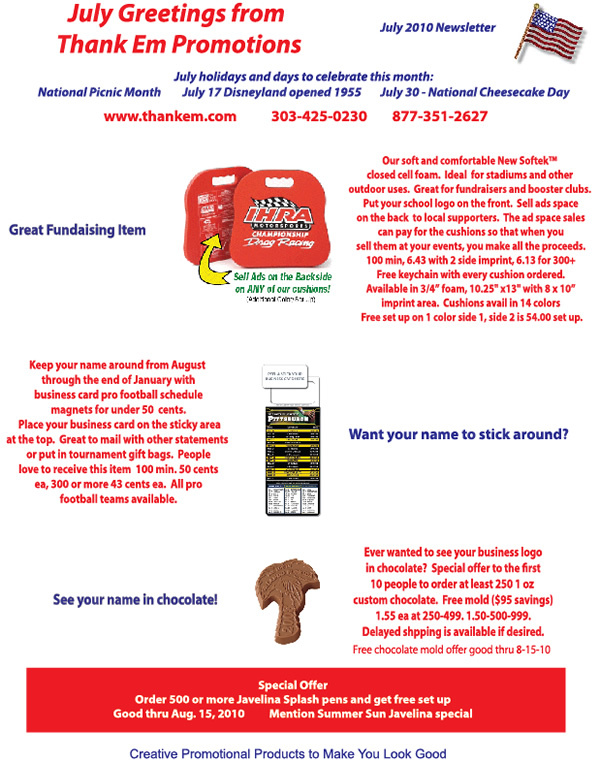 Great for MESA awareness or fundraising. #LT4214. Min is 200 bags. 2.40 ea. set up is 50.00. Imprint area is 8 x 11″ Available in black, blue, forest, gray, lime green, orange, navy, purple, red and yellow. Price includes one color imprint. Want a cool way to get your message out? Anywhere you park becomes a place where you can get your message out. Great for political campaigns! You can park in a lot or at a corner where traffic goes by, and voila, people passing by see your message. No one can take your sign down or tell you you can’t put a sign up if you can legally park there, your message can be posted.Read more about website design by the web design company Southend on the official website. Easy to open and fold down. Also great for school or booster club fundraisers and more. 16″ diameter imprint area on each side of front. Where can you get a big impact for 7.75 ea with a minimum of only 50 pieces. 7.50 ea for 100 or more through 9-25-2013. Also make great fundraisers for schools, churches and community groups. 50.00 set up. Contact cheryl@thankem.com for more information or for other ideas or items. (10.00 ea at 25-49 sunshades).